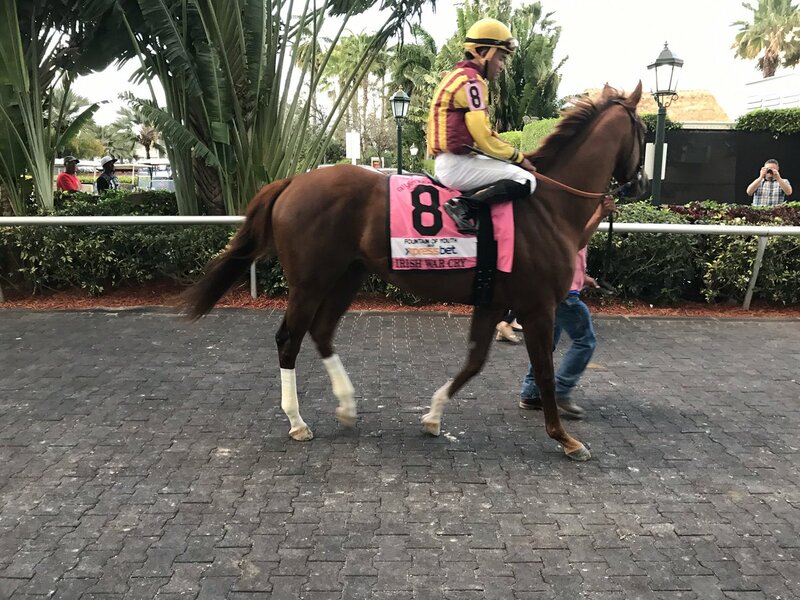 Irish War Cry looks to rebound in the Wood Memorial (photo by Jonathan Stettin). It’s been 17 years since a Wood Memorial Stakes (GII) winner went on to win the Kentucky Derby (GI) (Fusaichi Pegasus) and before that there was a 19-year gap. This year, Irish War Cry and Mo Town will look to not only buck that trend, but also to rebound from disappointing finishes as favorites in each of their last starts. Owned by Isabelle de Tomaso and trained by Graham Motion, Irish War Cry established himself as an early Derby favorite when he dominated a deep field in the Holy Bull Stakes (GII). The unbeaten son of Curlin was making his first start around two turns in that race after having previously gone only seven furlongs in his longest race. The colt returned to the scene of his Holy Bull win as the even-money favorite in the Fountain of Youth Stakes (GII) on March 4, but after chasing a solid pace early, he faded badly and finished seventh, 21 ¾ lengths behind the winner Gunnevera. Trainer Graham Motion has given no major excuse for the race saying, “the horse just had a bad day.” But he does expect to see Irish War Cry settled farther off the pace early in this spot. Mo Town, owned in partnership by Coolmore and Team D and trained by Tony Dutrow, was thought to be another superstar from the hot young sire Uncle Mo after his stylish win in the Remsen Stakes (GII) at age two, but the colt we’ve seen so far this year is a far cry from stardom. Mo Town made his 3-year-old debut in the Risen Star Stakes (GII). Sent off as the 3-2 favorite, he never truly got engaged in the running of the race and finished a distant fifth. The only reason Dutrow has been able to come up with for his poor showing is that he did not handle the surface at Fair Grounds. Johnny Velasquez, who was aboard the colt that day, has elected to ride Battalion Runner in this race; Mo Town will have Javier Castellano aboard. Battalion Runner is as highly regarded as they come for owner St. Elias Stable and trainer Todd Pletcher. The son of Unbridled’s Song will be making just his fourth start, with only a debut second, a maiden win and a first-level allowance victory to his name so far. A $700,000 yearling purchase, the expectations have always been high for the striking gray colt — and he’s passed every test to date with flying colors. He was originally slated to run in the Santa Anita Derby (GI); however, Pletcher elected not to put the stress of shipping all the way across the country on such a young an inexperienced horse. Rounding out the top contenders is Klaravich Stables Inc. and William H. Lawrence’s Chad Brown-trained Cloud Computing. From the first crop of the wickedly fast Maclean’s Music, the colt did not debut until Feb. 11. However, he showed plenty of talent and the ability to handle adversity when rallying from well back to win in his first outing. The effort gave Brown enough confidence to put the colt straight into stakes company in the Gotham Stakes (GIII). After tracking a torrid pace early, Cloud Computing stayed on well for second behind the very well-regarded J Boys Echo and defeated the heavily favored El Areeb, who was intended to start in this race but will now miss several months after having surgery to remove a bone chip from his knee. Rounding out the field are maiden winners Glennrichment, Bonus Points and True Timber, as well as Stretch’s Stone, who won a New York-bred allowance via disqualification in his most recent start. Carded as the 10th race on the program, approximate post time for the $750,000 Wood Memorial is 5:52 pm ET.